The people of Greece spoke decisively on Sunday, voting 61% to 39% to reject financial bailout terms called for by its creditors, but the country’s fraught relationship with the European Union faces critical hurdles in the coming days. While Greece deals with a major debt crisis and uncertain future in the eurozone, public opinion in Greece and elsewhere in Europe had shown clear signs of tension leading up to this point. Many European nations were hit hard by the recession, but Greece has been slower to recover, and its people have felt frustrated by persistently high unemployment and steep austerity measures imposed on them. Most Greeks polled in 2014 didn’t express particularly warm views of the EU. And public sentiment showed that many in other European nations harbor negative stereotypes of Greeks. 1Greeks have had little regard for the EU. Only about a third of Greeks have a positive view of the EU, according to a spring 2014 Pew Research Center survey. At that time, just 17% agreed that European economic integration had been good for their country. 2Despite their frustrations with the EU, and in the face of speculation that the current financial crisis could lead Greece to abandon the common European currency, 69% of Greeks want to keep the euro and not return to the drachma, our survey last year found. 3Greeks felt abandoned by their EU partners well before the current crisis. An overwhelming majority of Greeks (85%) said in 2014 that the EU does not understand the needs of its citizens. And 74% judged as inadequate the financial assistance the EU has provided to member countries, such as Greece, that are experiencing major financial problems. 4Greeks oppose the EU’s meddling in Greek affairs. More than eight-in-ten Greeks (86%) said the EU is intruding in their country’s business, and two-thirds (67%) felt the union is inefficient. There’s little wonder, then, that 71% of Greeks last year opposed giving more decision-making power to the EU to deal with Europe’s economic problems. 5 Greeks see themselves differently than others see them. 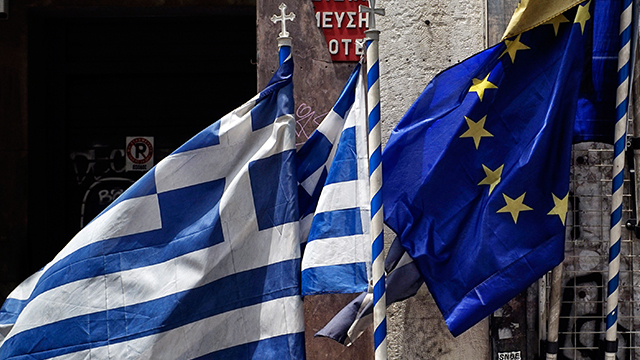 Contradictory stereotypes may complicate any resolution of the new Greek crisis. 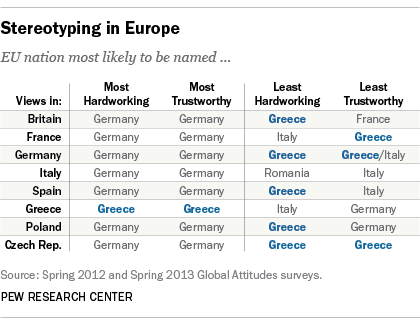 Greeks see themselves as the most hardworking Europeans, according to a 2012 Pew Research Center survey. The British, the Germans, the Spanish, the Poles and the Czechs all see the Greeks as the least hardworking. And the Greeks see themselves as the most trustworthy of Europeans, while the French, the Germans and the Czechs voice the view that Greeks are the least trustworthy, according to a 2013 Pew Research survey. This is an update of a post originally published on Jan. 27, 2015.